A hospital in Seoul said Wednesday it has successfully conducted South Korea's first simultaneous transplants of a liver from a donor with the same blood type and a kidney from another donor, with a different blood type, to a man in his 60s. In June this year, a team of doctors at Saint Mary's Hospital performed the transplantations to the man, who was suffering liver cirrhosis and chronic renal insufficiency. The case, published on the website of the journal Transplantation Proceedings, marked the first time in South Korea for a transplant patient to receive simultaneous liver-kidney transplants in which the kidney was donated by a person who has a different blood type from that of the recipient. 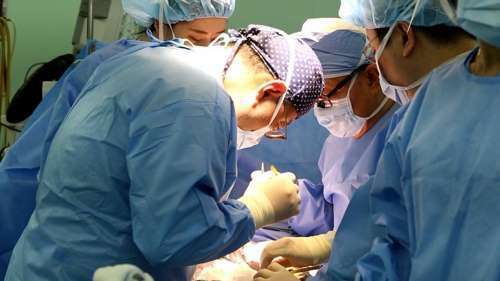 It also showed the team's capabilities in not only surgical operations but also anesthesia, as the transplants were done on the patient under a general anesthesia for more than 12 hours. The patient, who came out of an intensive care unit seven days after the transplants, has led a healthy life more than six months.